We passed by a friend’s house on our way home and as she was playing..she lost the tooth. As you can imagine she was very sad. We all spent the next half hour on our knees combing the floor looking for the tooth! no luck! We left after my friend PROMISED to look for it everywhere. On our way home I told Jana that I think that the tooth fairy will surely find the tooth and she will understand that we looked for it very hard and didn’t mean to lose it. That made my little one feel a bet better. When we got home I sneaked into her room and tucked some money under her pillow.. I was happy with myself, thinking I managed to dissolve the crisis…. My happiness didn’t last for long! The following week my friend passed by with a little jewelry box for Jana.. When she opened it …there was the tooth! Jana looked from the tooth to me then back to the tooth.. As you might have guessed, I forgot to tell my friend about my “clever” plan! After a moment’s silence I told her…the fairy must have felt sad for you because you cried so much when the tooth was lost and decided to give it back to you to keep as a memoir..
Jana looked suspiciously at me. I didn’t feel smart at all then..I added, how about you go write her a thank you letter…? That did it..She smiled and raced to her room. Today’s recipe can be a wonderful side dish or light meal. It is a wonderful way to use up zucchini . The onion, parsley and spices complement the zucchini nicely.A squeeze of lemon adds just the right tang. 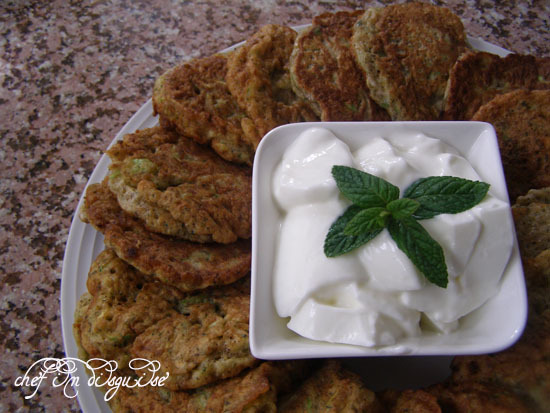 You can serve this with mint yogurt or marinara sauce.. it is yummy both ways. Beat the eggs with the salt, all spice,and paprika. Mix the zucchini, onion, parsley then add the eggs. Add the baking powder to the flour, mix well. Heat 2 tablespoons olive oil in a large saute pan over medium-high heat until oil sizzles when you drop a small amount of zucchini mixture into the pan. 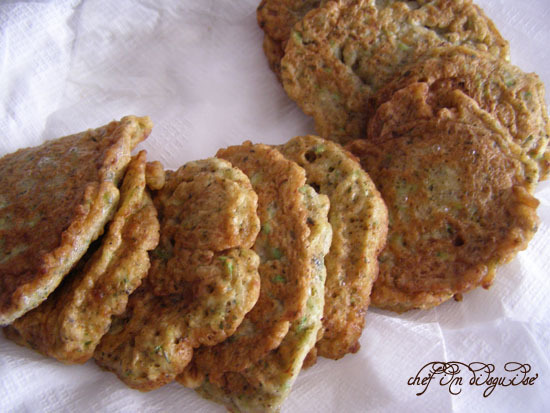 Carefully drop about 2 tablespoons zucchini mixture into pan; repeat, spacing fritters. Cook fritters until golden, 2 to 3 minutes. Reduce heat to medium. 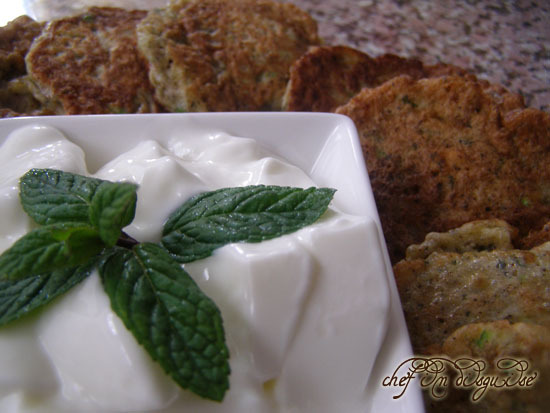 Turn fritters, and continue cooking until golden, 2 to 3 minutes more. Posted in Egg and tagged appitizer, baby teeth, eggs, fritter, postaweek2011, side dish, tooth fairy, zucchini. Bookmark the permalink. OMG!! just found this one…it’s offical, I MUST make these. Mint yogurt? Really? Go figure. 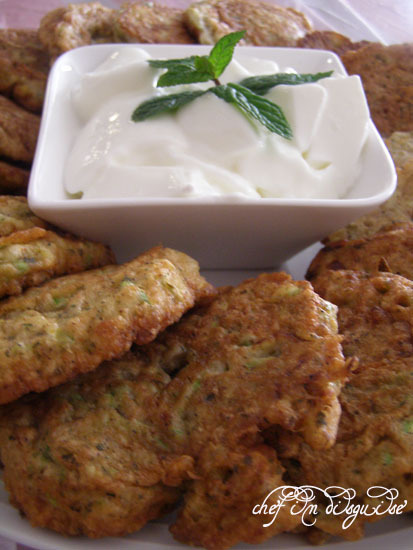 These zucchini fritters look amazing! These sounds wonderful – a perfect way to use up all the zucchini we are bound to have growing in our garden this summer. Thanks so much for sharing this in our Get Grillin’ event! This looks like great! I have to be the worlds worst at handling those kinds of situations with my kids, I think you did well. I recently discovered your blog. I AM LOVING IT! These fritters look fabulicious! And the recipe looks so easy too. Since I became disabled and unable to work, I subsequently became delightfully impoverished. “Delightfully” because being officially at the poverty level, I can no longer afford to eat out or have food delivered; therefore, I’m learning to cook again! Two of my favorite cuisines are Southeast Asian and … you guessed it … Middle Eastern! I have to salute you on your positive out look, the words we use and the way we look at the world can make the difference between a miserable existence and a happy one.